Sorry, this tune is presently not available for download in your country. This famous solo was written by Claude Debussy in 1913. It is commonly considered to be an indispensable part of any flutist''s repertoire. Many musical historians believe that “Syrinx”, which gives the performer generous room for interpretation and emotion, played a pivotal role in the development of solo flute music in the early twentieth century. “Syrinx” was originally written as incidental music to the uncompleted play Psyché by Gabriel Mourey. It was intended to be performed offstage during the play, and was originally called “Flûte de Pan”. Since one of Debussy's Chansons de Bilitis had already been given that title, however, it was given its final name in reference to the myth of the amorous pursuit of the nymph Syrinx by the god Pan. The god Pan was in love with the lovely maiden Syrinx. This love however, was not returned, and Syrinx evaded Pan by turning herself into a river reed and hiding in the reeds by the river. Pan was so upset that he cut down the reeds and made his Pan pipes from them. Of course this meant Syrinx had died and his love was lost forever. There's a persistent belief that the piece was originally written by Debussy without barlines or breath marks, and flutist Marcel Moyse added these later. However, this might actually be an urban legend, since a copy of the now lost autograph seems to prove the contrary. Update: György from South Africa points out that it is hotly debated whether the above manuscript is actually Debussy's handwriting and not that of the dedicatee Louis Fleury. 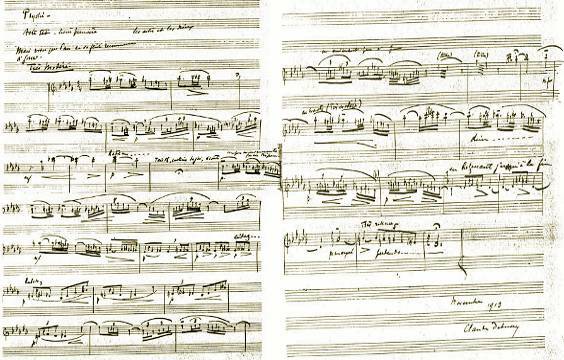 Handwriting experts say Debussy's signature is different in all other correspondence he ever made and signed.